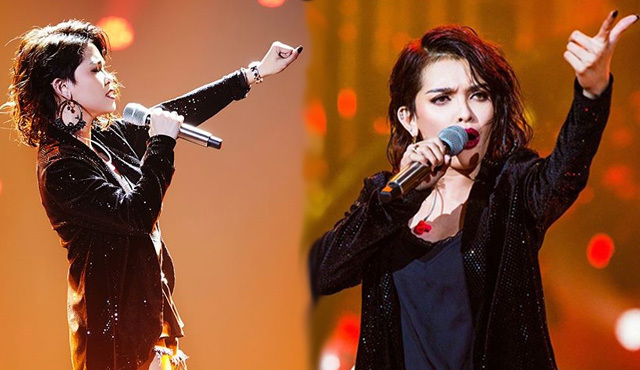 Since the day Filipina singer KZ Tandingan announced on her instagram account about her upcoming appearance on the 5th episode of Singer 2018, many are anticipating on what she will perform. The newest singing reality show in China is produced by Hunan Television where popular singers around the world will compete with each other and will be ranked based on the audiences’ and viewers votes. Since the show started, British pop singer Jessie J was at the top for the 1st 3 episodes and got 2nd place in the 4th. The 2 singers with the lowest votes will be eliminated and will be replaced by a new contestant. Before the X-factor Philippines winner’s performance, she was able to meet and talk with the “Price Tag” hit maker at the backstage and gave her a big hug. KZ then told her that when she can’t reach high notes anymore, she almost wanted to quit singing but it changed when she heard Jessie J as an artist. Dubbed in the Philippines as “Soul Supreme”, KZ came prepared as she performs her own version of Adele’s “Rolling in the Deep” in jazz style. Her rendition is more eclectic than the original version and gave it a twist by rapping some tagalog words. Throughout her performance, the audiences are enjoying it and the “Domino” singer even said that she has a big voice. In the end, the results of their ranking were revealed and KZ got the top spot dethroning Jessie J who is dominating the contest. Completing the list are Hua Chenyu, Wang Feng, Juno Su, Angela Chang, James Li and Tien Li. As of this typing, her video on the official facebook account of the show now has 3.2 million views, 133 K likes and shared by 168 K users. KZ is also trending in our twitter and youtube trends where fans and casual viewers alike are very proud of her achievement.